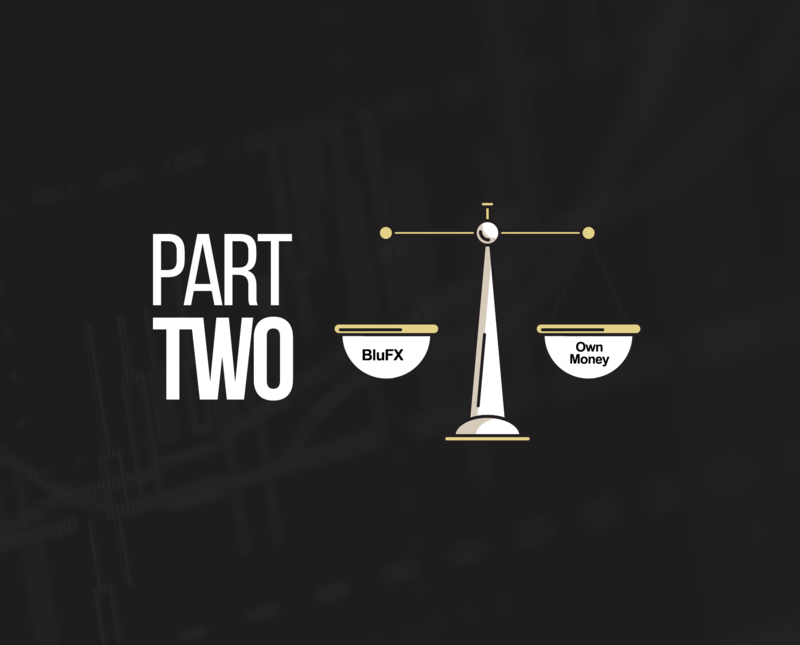 In Part 1 we looked at how leverage options affect the outcome of deploying a fixed amount of money at BluFX or at a broker. We will now look at how that choice applies specifically to 4 typical trading career trajectories. The question of whether it’s better to leverage your 200 or pay it to BluFX as the monthly fee will depend on your expectation for your trading success. We will now look at the 4 most common types of trader career trajectories. Simply put, your expectations for your trading career should fall broadly into 1 of these categories. To answer the question, we are going to look at the typical trajectory of a trading career when the decision of broker vs BluFX are most pertinent at the start. The 4 trader profiles cover all traders who have the choice of BluFX or personal account. All four trader types can afford $250 a month. The $ amount of the BluFX monthly cost of £200 is estimated at $250. 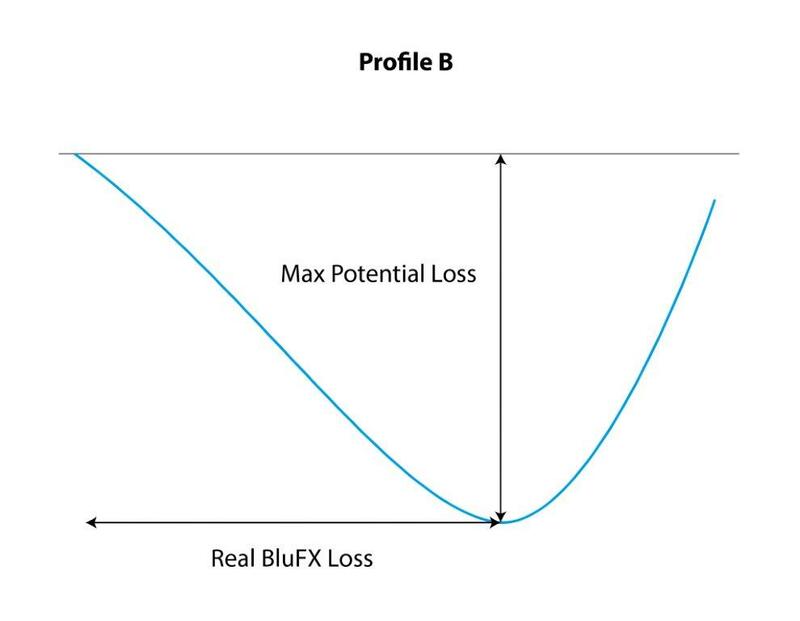 The main consideration if any individual could predict his trading career would be if his maximum potential loss is greater than the real BluFX loss. The potential loss is the largest amount he would be out of pocket either on his own account or on BluFX’s account. However, on a BluFX account his real out of pocket loss would be the amount of months spent multiplied by the monthly fee of 200. Therefore if a traders maximum potential loss is 1200, then he would not have to be out of pocket by 1200 provided it took him less than 6 months (200 x 6 = 1200) to become profitable. Therefore the actual cost to the pocket is time at BluFX or real money at the broker. ♦ Trader A Loses 100 pips at beginning of his career before eventually becoming profitable and making 500 pips. A trader losing 100 pips at the start of career would be down $1000 at the lowest point and after recovery would be up a net $4000 profit. With his own account and assuming he risks the maximum of $250 per month, would then be down for 4 months before finally becoming profitable. He would then be able to keep 100% of the 4000 net amount he has in the account. This is the same profile as a trader losing 1000 pips to start and then recovering to make 5000 pips. He would be down a maximum of 10,000 before ending up 40,000. At BluFX he would be allowed to reach the maximum drawdown much quicker than on his own account. He is therefore left with a net of 4000 no matter how many months it took. At BluFX the same maximum personal risk of 250 per month would allow him to continue making losses beyond his own personal monthly investment of 250. He could therefore continue that month and complete his initial losing period of 100 pips. At this point he would be down 250 personally but 1000 on his BluFX account. For the second part of his trajectory he would make 500 pips. Assuming that takes only a month then he would be down 500 personally on 2 monthly charges, but up 4000 in his account. He would be able to draw out 50% of the 4000 which is 2000. However, after removing the 500 costs he is left with a net gain of 1500. If this trajectory took 4 months his net would be 1000. Another way to look at this is to say if Trader A has a 50/50 chance of profit or loss then he has paid 250 for an option that pays out 25% of winnings and 0% of loss. For Trader A, the personal account option would be better if he can afford to limit his monthly loss to 250 whilst on his losing period. If he can’t do this or wants to complete the trajectory as quickly as possible then BluFX allows this for an additional 250 per month. The 250 cost is therefore a direct charge for the guarantee of completing the trajectory. 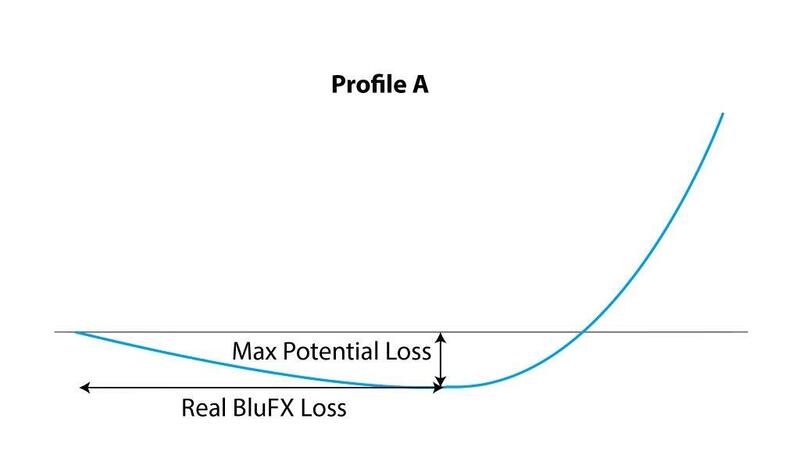 A trader that eventually becomes profitable will spend more at BluFX but will be guaranteed not to run out of money if he can only afford a 250 loss each month and cannot limit his loss to that on his own account. ♦ Trader B Loses 500 pips at beginning of his career before eventually becoming profitable and making 500 pips. A trader losing 500 pips at the start of career would be down $5000 at the lowest point and after recovery would be up a net $0 profit. With his own account and assuming he risks the maximum of $250 per month would then be down for 20 months before finally breaking even. He is therefore left with a net of 0 no matter how many months it took. This assumes he spreads the risk. If he does not then he can lose all 5000 very quickly and then make it back slowly. At BluFX the trajectory to losing the whole 5000 could be completed in one month at a cost of 250. If it took 3 months he would have a net personal loss of 750. BluFX doesn’t help him spread out the trajectory. However, the BluFX option would give him the choice of walking away from the trajectory early if he lost all faith. ♦ Trader C Loses an affordable amount at beginning of his career before eventually becoming profitable and making 500 pips on any size position each month of his career. On a personal account this trader would be able to draw 100% of the 5000 each month or he could choose to build his account size. If he kept all profits in the account he would have 5250 in the account and be able to trade with $100 per pip. If he again makes 500 pips he would be able to withdraw the full 50,000. - Result is 50,000 withdrawal! At BluFX trader C would make 5000 in his first month and then be upgraded to a 100k account and each pip would be worth $20 and so in his second month he would make 10,000 and be able to withdraw 5000. He would have to not withdraw for 4 months to get to the 1million account that would allow him to make 50,000 and withdraw 25000. For the profitable trader, a personal account allows him to withdraw double the amount in half the time with a personal risk limited to his initial deposit and subsequent unrealised profits. ♦ Trader D Loses 5000 at beginning of career before eventually admitting defeat. This trader would only lose 250 per month on his trajectory at BluFX. On his own account, he would lose 5000. Therefore, for a trader who has heavy losses trading with BluFX allows him to trade for 20 months. 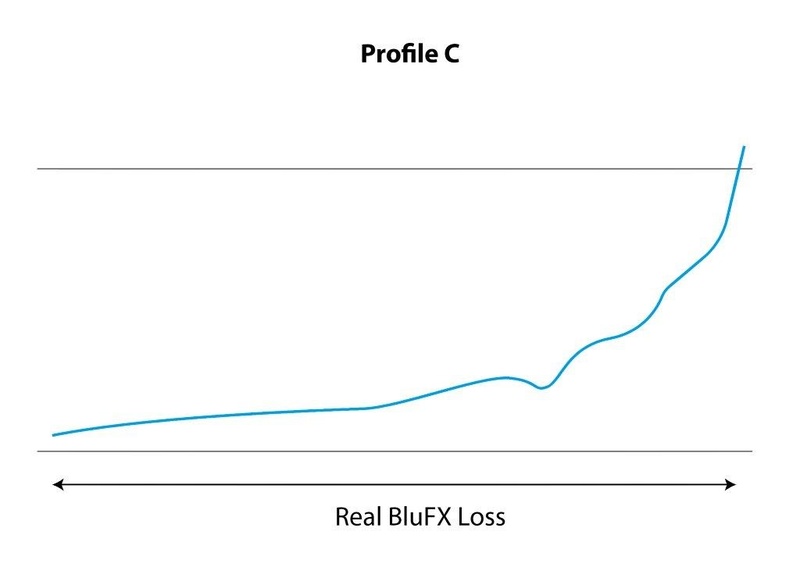 This is the main advantage of BluFX. His losses are limited to 250 a month if he is unable to do the same with his personal account and cannot afford to lose more than 250 a month. 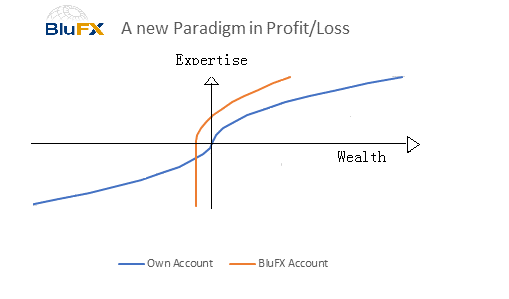 The main difference between opening a personal account or joining BluFX is the psychological aspect of trading and losing your own personal funds. This is a two-edged sword. For those with discipline, an affordable amount should be kept aside and written off as personal ‘training’ loss. Therefore, we take for granted that it will cost money to become a profitable trader. BluFX allows you to do it with the personal risk limited to an affordable sum on a monthly basis. Therefore, for anyone concerned about their ability to control the amount of ‘training’ loss they allocate, BluFX offers a solution. However, this solution is expensive for a trader with a continually profitable trajectory.